Espionage, diplomacy, conspiracy, passion, and power are the sensuously choreographed steps of the soaring new high fantasy novel by Ilana C. Myer, one woman's epic mission to stop a magical conflagration. Lin, newly initiated in the art of otherwordly enchantments, is sent to aid her homeland's allies against vicious attacks from the Fire Dancers: mysterious practitioners of strange and deadly magic. 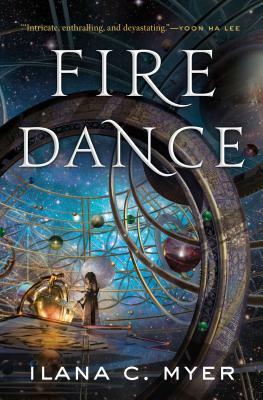 Forced to step into a dangerous waltz of tradition, treachery, and palace secrets, Lin must also race the ticking clock of her own rapidly dwindling life to learn the truth of the Fire Dancers' war, and how she might prevent death on a scale too terrifying to contemplate. Myer's novel is a symphony of secret towers, desert winds, burning sands, blood and dust. Her prose soars, and fluid movements of the politically charged plot carry the reader toward a shocking crescendo. ILANA C. MYER lives in New York City. Under her real name, Ilana Teitelbaum, she has written for The Globe and Mail, the Los Angeles Review of Books, Salon, and The Huffington Post. Previously she was a freelance journalist in Jerusalem for the Jerusalem Post, the Jewish Daily Forward, Time Out Israel, and other publications. Fire Dance is her second novel, following Last Song Before Night.